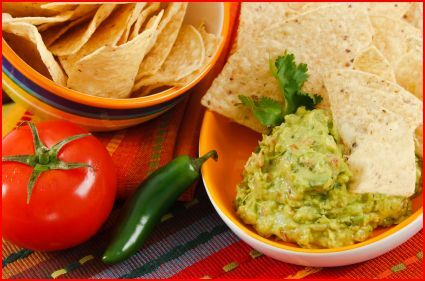 Guacamole is a dish we all associate with Mexican cuisine, however, it was the Aztecs who originally made guacamole, and gave us the name we all know (they called it ahuacamolli, or “avocado sauce” in Nahuatl). Guacamole is made up of mashed avocado, lime juice, salt, cilantro, and onion (diced fresh tomatoes are also often added). It can be served as a sauce for tacos or other traditional dishes, or with totopos, or tortilla chips. Empanadas are the perfect on-the-go snack. They are stuffed semi-circular dough rounds, often filled with seasoned meat, cheese, seafood, vegetables, or fruit, and baked or fried and are called empanadas after the Spanish word for wrapping or coating in bread, empanar. They are common all over Latin America, and can be found anywhere from Puerto Rico to Argentina. You can eat them with your hands, at street fairs and food kiosks, or with a fork and knife in a restaurant, but whichever way you eat them, you’re in for a tasty bite! Like guacamole, tacos are a traditional Mexican dish that is known worldwide. In Mexico, tacos are small, hand-held tortilla rounds stuffed with a variety of fillings, from beef, chicken, and seafood, to cheese and vegetables. You can add a whole list of toppings and garnishes, including guacamole, cheese, cilantro, onions, and more. If you are ever in Mexico, make sure to try a taco al pastor (shepherd style) made of pork seasoned with adobo and cooked on the rotisserie, it’s a national favorite! Ceviche is a typical Central and South American seafood dish that is made of raw fish that is marinated and cooked in citrus juices, like lime or lemon juice. It is also seasoned with cilantro, onions, avocado, tomatoes, and more, and differs based on country. Peruvian ceviche is made of raw fish and served with sweet potato. In Ecuador, ceviche tends to be made with shrimp and marinated in a tangy tomato sauce and served with toasted corn kernels or fried green plantain slices. In Chile, ceviche is made with halibut and marinated in grapefruit juice. Central American and Mexican ceviche can be either shrimp, squid, and tuna, marinated in chile, lime juice, and garnished with avocado, tomatoes, and cilantro. Churrasco is a typically Argentinian, Chilean, Nicaraguan, Uruguayan, and Brazilian dish of grilled beef, though it is also popular across Latin America. You can find churrasco in churrascarias, or steakhouses, where you can have your fill of grilled meats and beef! Probably the most popular dessert/sweet in the world, chocolate is originally from Mesoamerica and was consumed by the Maya and Aztecs as a fermented beer-like beverage and food ingredient. Unlike the more common association of chocolate as sweet, the Maya and Aztecs consumed a bitter chocolate. It wasn’t until the Europeans began consuming chocolate that it resembled what we now imagine when we think of chocolate. They added milk and sugar, and began reserving it solely for desserts or sweets. Next time you try some Belgian chocolate, think about its origins and the many transformations it had to undergo to become the chocolate we all love.